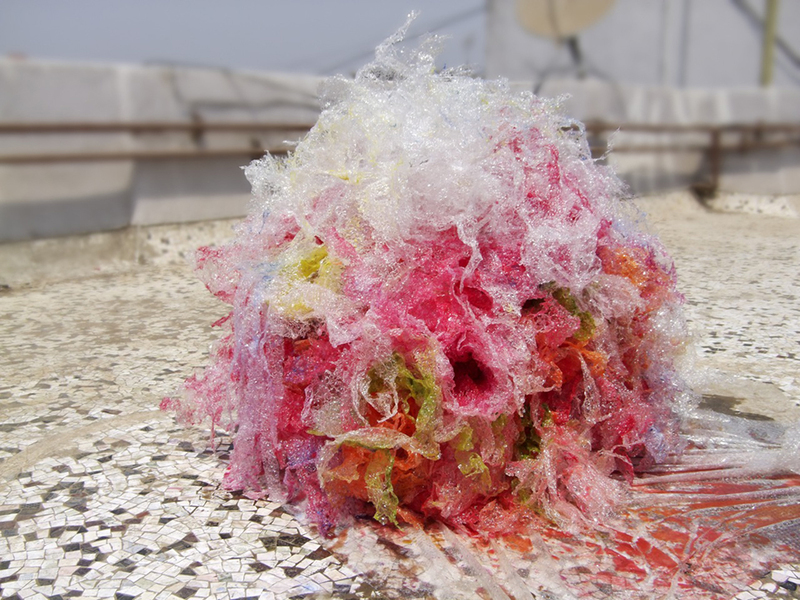 Indian artist Aaditi Joshi works with site-specific environmental installations that tell of pollution and the historical heritage of her native city. As an inhabitant of Mumbai, one of the most populated and polluted metropolis in India, Joshi gets extremely influenced by the large amount of debris and trash she sees around herself on a daily basis. 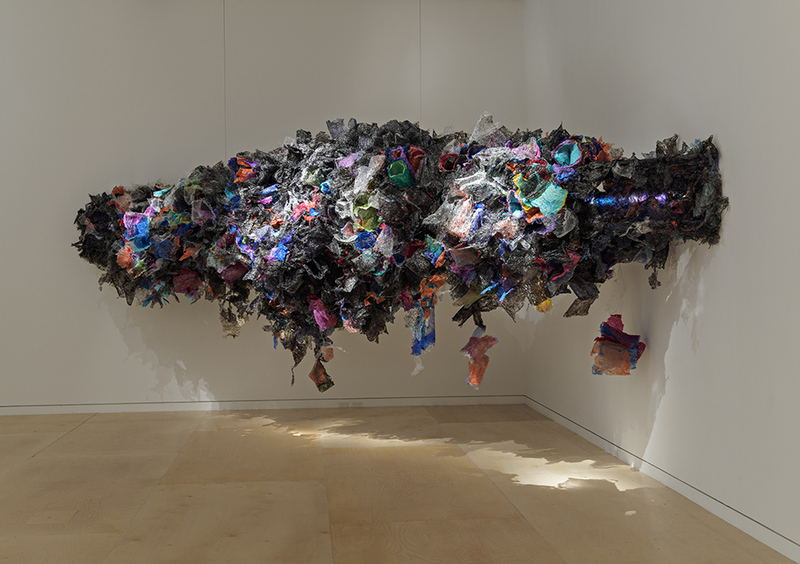 However, she looks at such ‘plastic’ landscape in a renewed way, reading garbage as sculptures, which she then alters, reworks and combines with other more ‘artistic’ media like paint and wood. Her series of sculptures are fluffy, flamboyant and ultra-colored clouds, and aesthetically recall a three-dimensional evolution of French Impressionist Monet’s series of Water Lilies. Their pleasant and jubilant appearance that effortlessly draws the viewer’s attention and calls for interactiveness, hides a rather more obscure awareness of today’s environmental conditions and natural disasters caused by the human abuse. Through a blend of total control and total spontaneity, I interact and experiments with my medium, and elevate plastic to explosions of colour and visual poetry. Highlighting that which is sublime and expressive, through this I invite to viewer to look at objects bypassed and overlooked, with fresh eyes. Aaditi Joshi, ‘Untitled’, 2016, fused plastic bags, acrylic paint, LED lighting, wooden armature, 108 x 78 x 288 in (approx). Photo: © Museum of Fine Arts, Boston. Image courtesy the artist and Gallery Maskara. 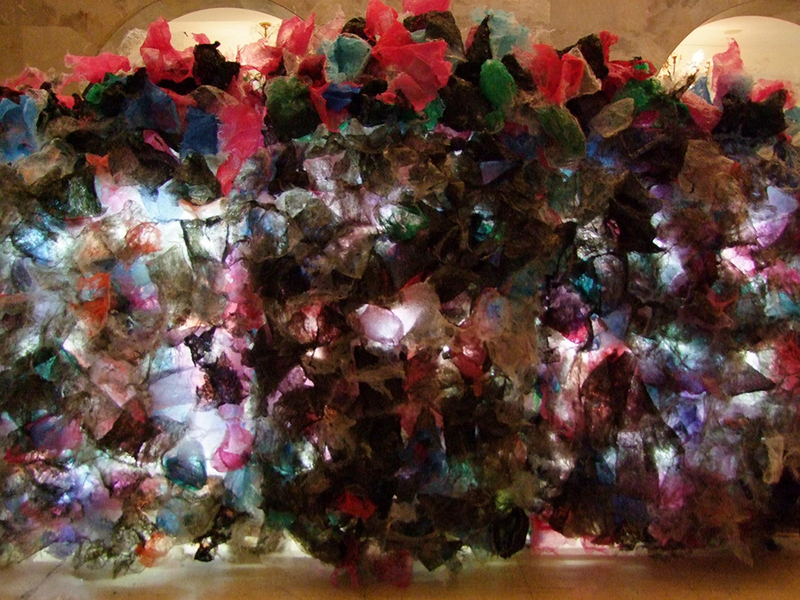 Aaditi Joshi, ‘Untitled’, 2012, fused plastic bags, acrylic colour, LED lights, wood, 84 x 180 x 30 in. Site-speciﬁc installation at SH Contemporary 2012. Image courtesy the artist and SH Contemporary. 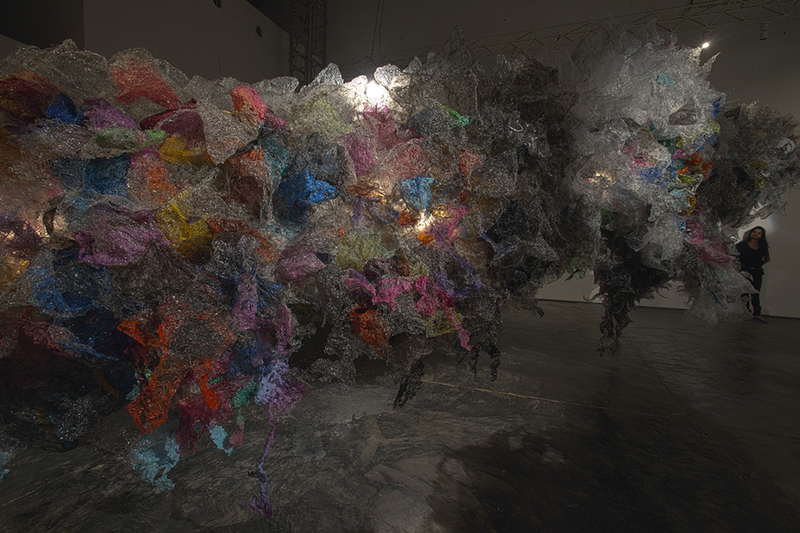 Aaditi Joshi, ‘Untitled’, 2011, fused plastic bags, acrylic paint, on wooden and acrylic base, 110 x 94 x 432 in. Installation view of “New Works’ 2011-12” at Gallery Maskara. Image courtesy the artist and Gallery Maskara. 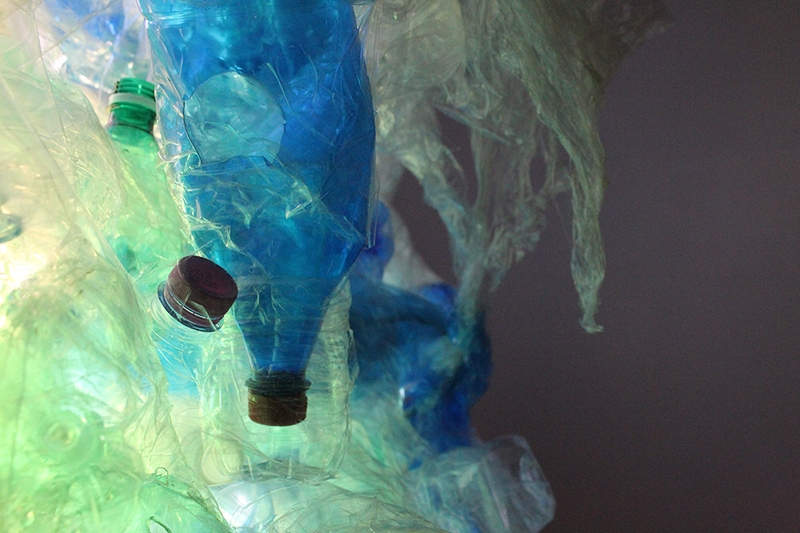 Aaditi Joshi, ‘Untitled’ (detail), 2011, fused plastic bags, acrylic paint, on wooden and acrylic base, 110 x 94 x 432 in. Image courtesy the artist and Gallery Maskara. 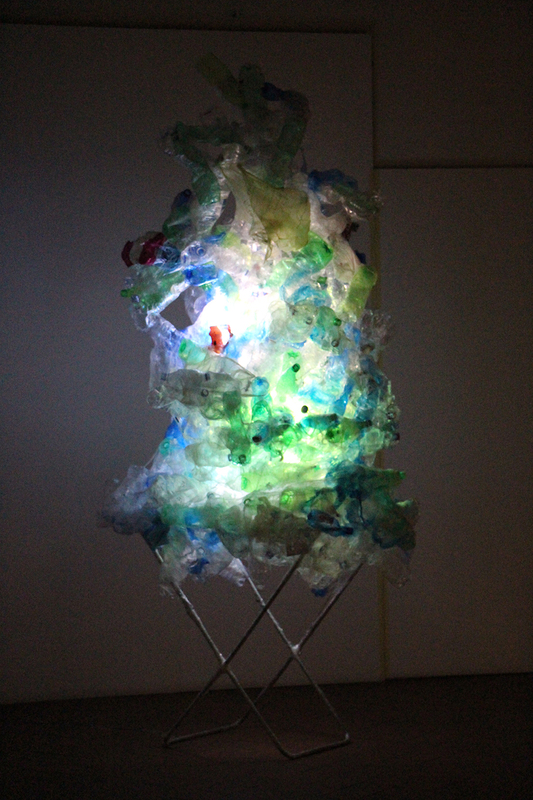 Aaditi Joshi, ‘Untitled’, 2013, used plastic PET bottles, found aluminum stand, LED light, 96 x 65 in (approx.). Site-speciﬁc installation from the show “People Without Memory is a People Without Future” at Casa Masaccio, Italy. Image courtesy the artist and Casa Masaccio. 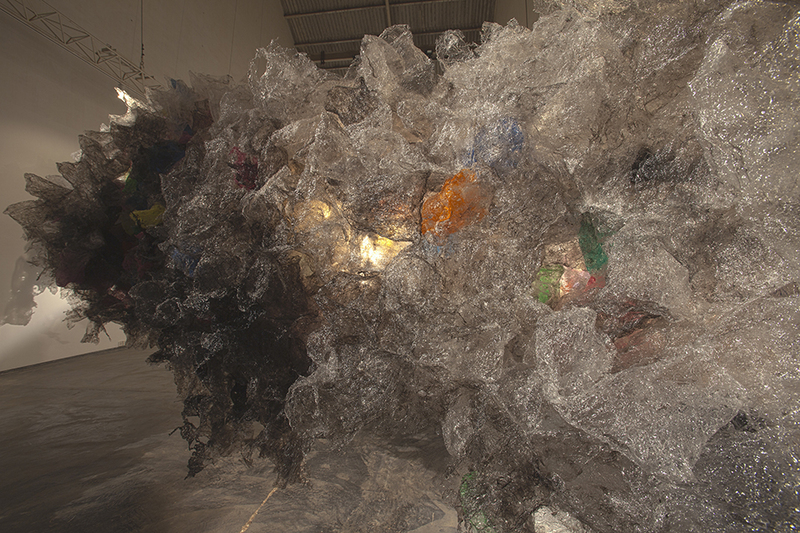 Aaditi Joshi, ‘Untitled’ (detail), 2013, used plastic PET bottles, found aluminum stand, LED light, 96 x 65 in (approx.). Site-speciﬁc installation from the show “People Without Memory is a People Without Future” at Casa Masaccio, Italy. Image courtesy the artist and Casa Masaccio. Aaditi Joshi, ‘Untitled’, 2011, digital print on Hahnemuhle paper, UltraChrome K3 ink, 40 x 53.3 in. Image courtesy the artist.